La Hacienda de San Angel welcomes guests to enter a family estate and sample some local dishes that are bursting with flavor and, in some cases, innovative in their creation. No host, however, would welcome you into their hacienda without offering some wine or other beverage as a sign of friendship. There are plenty of options if you’re looking for wine or tequila, particularly if you are interested in a premium margarita. While the Skipper Canteen may have answered the question of what happened to Rosita, I couldn’t help looking at the menu and wondering what the Rosita Margarita tastes like. For starters, the cocktail that arrived at my table was simple and beautiful. 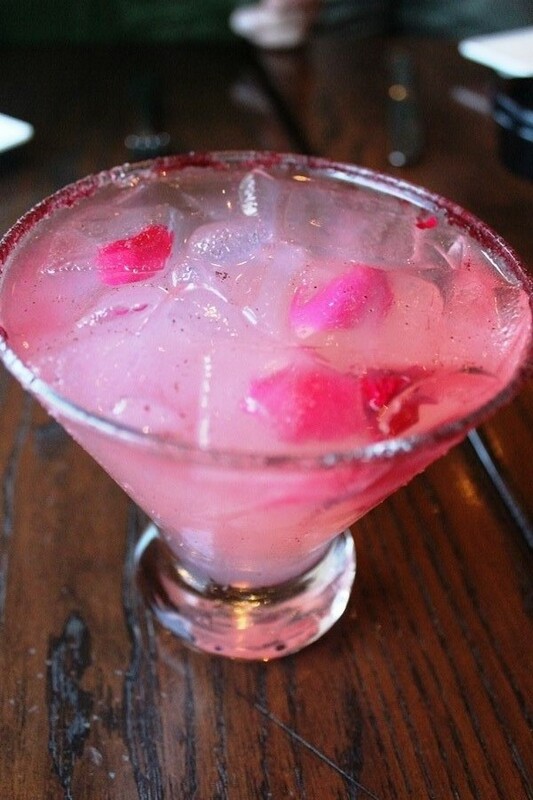 The Rosita Margarita is light pink in hue, with a deeper red rim, and a few rose petals added in for good measure. It contains Exótíco 100% agave premium silver Tequila, fresh lime juice, orange liqueur, and a rose infusion. This is not a frozen concoction, but rather a margarita that is served on the rocks. The rim is coated with hibiscus Himalayan salt. This drink is actually as delicate as it looks. The citrus notes from the orange liqueur and lime juice are bright, but they do not overwhelm the rose flavors highlighted in the drink. The hibiscus Himalayan salt does a nice job of building on the floral flavors from the rose infusion. While you won’t miss the tequila, it doesn’t overpower the rest of the ingredients. In fact, the Rosita Margarita is light and easy to drink, which means you should definitely mind how quickly you are able to finish this sweet and tangy mixture. There are more traditional margaritas to be found at La Hacienda de San Angel, as well as some more intriguing takes that offer up intriguing combinations and even some heat. The Rosita Margarita is a great margarita for those who don’t have an overly adventurous palate, but who also want something more than lime juice, salt, and tequila.